When detectives come upon a murder victim, there's one thing they want to know above all else: When did the victim die? The answer can narrow a group of suspects, make or break an alibi, even assign a name to an unidentified body. But outside the fictional world of murder mysteries, time of death determinations have remained infamously elusive, bedeviling criminal investigators throughout history. Armed with an array of high-tech devices and tests, the world's best forensic pathologists are doing their best to shift the balance. But as Jessica Snyder Sachs demonstrates so eloquently in CORPSE, this is a case in which nature might just trump technology: Insects, plants, and biochemicals found near the body are turning out to be the fiercest weapons in our crime-fighting arsenal. In this highly original book, Sachs accompanies an eccentric group of entomologists, anthropologists, biochemists, and botanists--a new kind of biological "Mod Squad"--on some of their grisliest, most intractable cases. She takes us to the ultra-bizarre Body Farm in Knoxville, Tennessee, where scientists watch bodies decay in order to learn the secrets of decomposition and death. She also takes us into the courtroom, where "post-O.J." forensic science as a whole is coming under fire and the new multidisciplinary art of forensic ecology is struggling to establish its credibility. "The dark side of life may be death, but a riveting side of death is CORPSE. In this darkly lyrical book, Jessica Snyder Sachs reveals how crime fighters are learning to read the clues of the post-mortem body, studying natural -- and sometimes not so natural -- signs.... The body is a dynamic thing when it's alive; Sachs reveals just how dynamic it can still be after it dies." 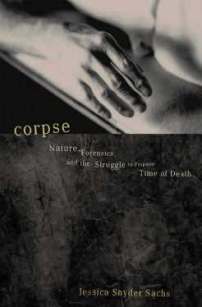 "CORPSE brilliantly explores the determination of time of death with forensic evidence, from the body to the maggots. It's a must read not only for forensic investigators but also for those learning how science can solve the problems of the past." "Sachs's first effort traces the long history of attempts to pinpoint time of death. ... she brings humor and insight to a neglected but fascinating subject." "Amid the plethora of popular books on forensic science, it's hard for writers to find a new slant. But Jessica Sachs has found one ... the book is genuinely interesting and well worth reading." "Sachs's book is a lucid, oddly fascinating work of popular science, though not for the queasy of stomach or faint of heart." Listed below are links to blogs that reference this entry: Corpse. This page contains a single entry by JSS published on November 18, 2006 6:42 PM. Reference Books by Jessica Snyder Sachs was the previous entry in this blog. Good Germs, Bad Germs is the next entry in this blog.